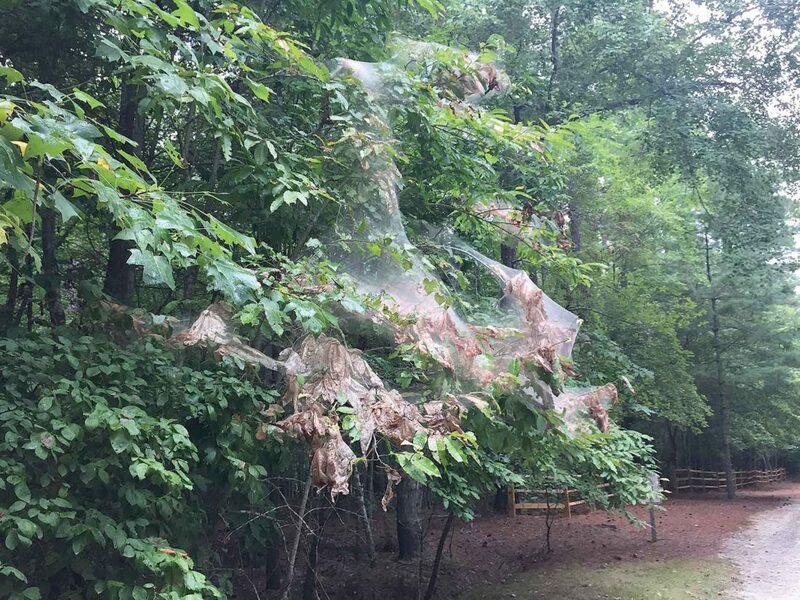 Fall web worms and their messy web nest are showing up on trees and shrubs. The caterpillars feed on the leaves of the trees and shrubs, and then retreat to the nest at night. Unless it is a very small tree or shrub, or one very recently planted, they will do no serious damage to the plant. It is just an eye sore. The easiest way to control them is to wait until late evening when the caterpillars have returned to the nest. Then cut off the end of the branch with the nest attached, seal it in a plastic bag, and put it in the garbage. Problem solved safely. If they are too high in the tree, the biological control, Bacillus thuringiensis, can be sprayed on the leaves. Bacillus thuringiensis is a naturally occurring bacteria that attacks and kills only caterpillars. It is safe for birds, animals and humans as well as other insects. Once infected, the disease will spread throughout the nest and kill all the caterpillars. Since it is safe, birds can eat the dying caterpillars with no ill effects. This is sold under a number of trade names by local nurseries and greenhouses. Japanese beetles are a major pest of yards, gardens and field crops in the eastern USA. Unfortunately, they are being spread westward by nursery stock which has the larvae in the soil of the potted plants. The larvae feed heavily on plant roots much like June beetles larvae (white grubs) do, and the adults feed extensively on a great number or yard and garden plants as well as agricultural crops. In cooperation with the North Dakota Department of Agriculture, traps have been placed across the state to detect the presence of these insects. Since North Dakota has only very recently seen the introduction of this insect, efforts are being made to detect and plan for their control. Pheromone traps have been distributed and placed across North Dakota to trap adult beetles. A pheromone is a substance which animals use to announce danger, or hunger, or food sources or mating activity. The pheromones are specific to each insect. There are five of these pheromone traps in Ward County. This past week two of three traps which were checked contained the adult Japanese beetles. The remaining two traps will be checked next week. Homeowners and farmers should actively scout for these beetles. They are very colorful and will be feeding on the leaves of plants. If you find them, please report them to the Ward County Extension office. Wasps, hornets and yellow jackets are all the same insect. They are an aggressive stinging insect which at least are painfully annoying and at most life threatening to those who are allergic to their sting. They build paper-like nests in trees, on or in buildings and even under ground. 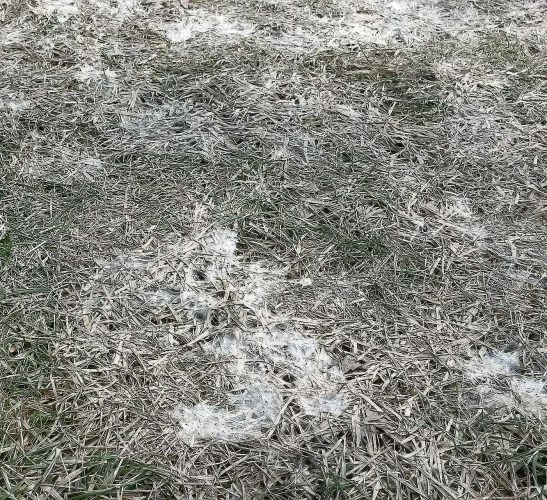 If a nest is found, it can be sprayed at night with special aerosol wasp insecticide which is designed to be sprayed from a distance. At night all the wasps will be in the nest and they all should be killed. 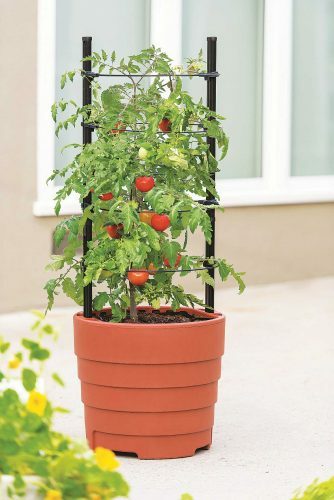 These are available at nurseries, hardware and farm supply stores. Wasp traps are also available that use a sweet liquid such as orange juice, soda pop, and one of the most effective, hummingbird food, to draw the wasp in. The trap is designed so escape is difficult and the trapped wasps drown. Traps should be placed away from patios, play yards and living areas as they will attract wasps from a distance. Empty and refill traps as needed.